In 2002, after a couple of years as an occasional solo performer, something momentous happened: someone found my web page and wrote to me. This was before MySpace and the rest, so… it was an enormous big deal. The someone who wrote in was local musician Seth Howard. We sent a couple of emails back and forth and then met up to talk about an idea he had, which was to start a weekly showcase for solo and/or acoustic performers, such as we were. At the time there were few venues for solo artists, and few bookers booking them. We each contacted some others who might be interested in joining in — Seth talked to the Stares, I talked to DGH. 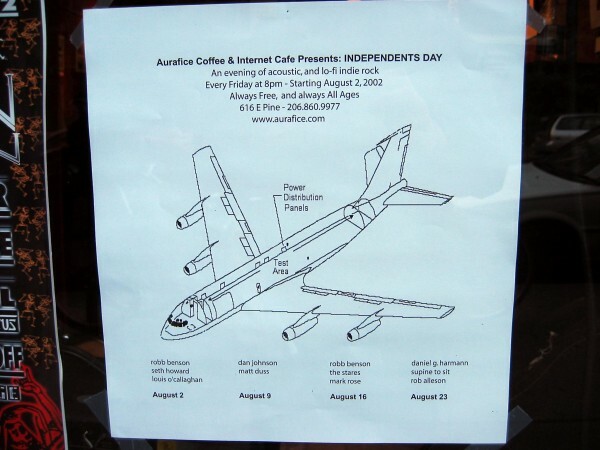 As it happened I’d already curated a few shows at Aurafice Cafe on Pine Street in Seattle’s Capitol Hill, so we had a venue. We all got to work and booked some artists, with shows to begin in August. We decided to call it Independents Day. We had some guidelines: the shows would be on Fridays and would start at 8, with 2 or 3 performers playing 30-minute sets. This would allow audiences to attend this gig then still have time to go to a bar show. The artists would be solo or small combos, the limits being that the stage was tiny and the venue didn’t want it to be too loud. Ideally the headliner would be someone more or less well-known, so the openers could have an audience. Admission was free. The shows started out strong and had good attendance, and we were enthusiastic — we were bookers! Which meant having shows on our own terms. For a while we made an effort to take photos of every gig and tried things like recording the performances and Shoutcast streaming. We had a show almost every week for about a year, at which point we burned out and never wanted to be bookers again. What happened? The frequency was probably the biggest thing. Had it been one show a month, it would have been much easier. As it was though, we had to find two or three people a week. Seattle has lots of musicians, but most hadn’t heard of our series. We ended up booking a lot of the same people repeatedly (including ourselves). Few “well known” acts were interested. Also, attendance was not usually that good. Aurafice had a built-in audience of Friday night regulars, but they were not there for music. Many artists didn’t take enough responsibility for promoting their show. We got one piece of press, an article in the Stranger by Megan Seling. The piece was complimentary, but also reflected that this format was “not her thing.” It wasn’t most people’s thing. And finally, our own interest was hard to sustain. We were scattered around town and had other projects. It was difficult to share responsibility among us, especially with booking. Ultimately Seth and I were the only ones actively involved, and we found other unpaid things we’d rather do. So that was that. It sounds like failure. Compared to what though? A bunch of musicians who start booking shows are musicians that want to play more shows. We did that. We had good times, made friends, and learned things. Things like, “I don’t like being a booker.” But also other things. Click here to see my I.D. photo collection on Flickr. Or click the links below for individual show photos sets.